In our daily life, we do not get time to enjoy or have fun frequently. So, sometimes planning for a great party with friends or family seems important as they just freshen up your mind. You can host a birthday party, and anniversary party or just a get-together party as well. But, in our fast pacing world, do we get enough time to get things sorted for organizing or managing an event? Well the answer usually is no. So, what to do? To make things simpler, we have apps for every single purpose nowadays. We also have some best apps that are available on your iPhone or iPad that lets you create or plan parties and events and helps you manage them. These apps are simple and has been developed so that you do not miss any of your important days, events and plan for different parties with friends and family. With those Apps, you can make party lists, set reminders for your much important tasks, definitely helping you to create a great event. 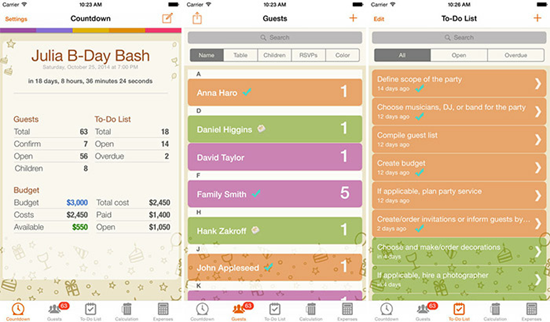 Well, there a bunch of party planner apps available, some are free, and some are paid. Among them we have handpicked the best ones out for you for the year 2019. Tips: If you lost any precious data for your party, like the photo or video of memories, you can always use the professional Jihosoft iPhone Data Recovery to get them back from your iOS device with/without backup. Are you finding it tough to create and manage invitations for any party or event hosted by you? 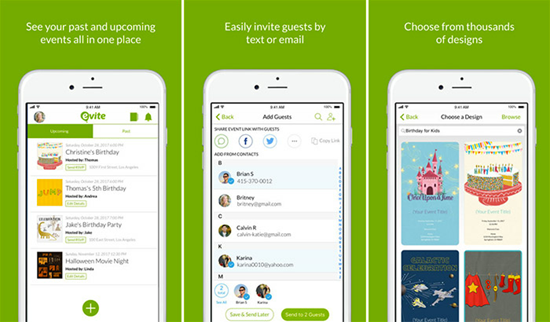 Then Evite is the best choice for you to plan your party on iPhone. The app gives you tons of handcrafted invitation options designed for all types of occasions to choose. Also by using 3D Touch, you can quickly create any event invitation. The app features a custom dashboard that lets you track everything easily. Never want to miss out any of your local yet popular event? 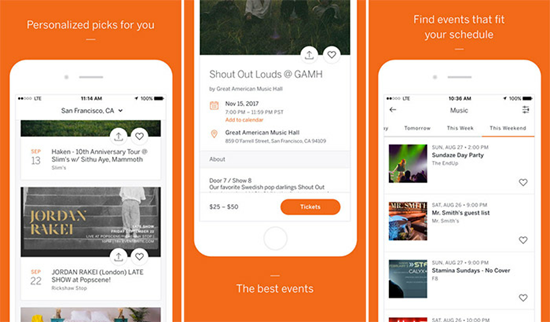 Eventbrite helps you discover all the local events around you. It also suggests special recommendations out of your interests. You will also be able to find out the events that your friends are going to attend. The app lets you register for any occasion and even get tickets for the event or occasion easily. Having integration with Apple Pay, you can easily make hassle-free payments. Also, you can share some of the exciting events with your friends, family and loved ones. 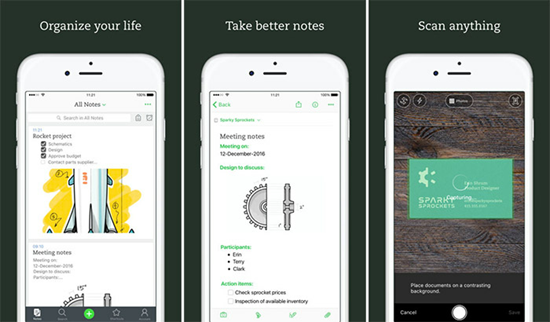 Evernote is a widely available free party planning app for iPhone to plan your various tasks, events and other stuff. With this app, you can quickly take notes in several formats like: text, sketches, photos, audio, video, PDFs, web clippings, and more. By using camera, you can even scan business cards, handwritten notes, drawings and organize them according to your need. You can also share your task with your friends and colleagues to discuss it and even collaborate with them. With the app you will be able to plan your event, set reminders about it to get notified with your progress. 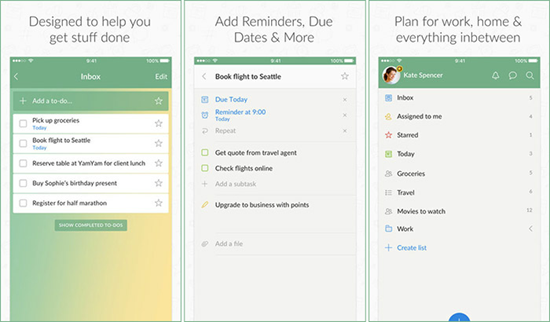 Wunderlist is known for its efficiency in handling to-do lists and managing your tasks effectively on iPhone and iPad. 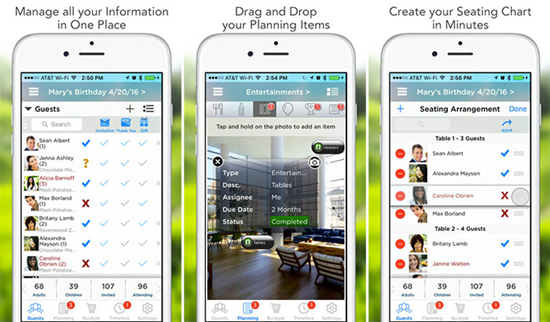 Its simplified UI makes it easier to add, organize and schedule your task and events. The app lets you set due dates and reminders so that you get timely alerts about upcoming events and planning. You also get to share lists with your friends and co-mates. Also it allows you to add subtasks, comments or notes to your task and events that make things simpler. Are you planning for any party and desiring that things go by your way? Then you surely need Birthday & Party Planner app which is quite known for its simplicity and productivity on iPhone. The app lets you plan a variety of parties and events like wedding, birthday party, jubilee, baptism and much more. After selecting party theme, you get a to-do list as well. Also, it helps you prepare everything perfectly and smoothly, ensuring that nothing is left for the eleventh hour. You can even customize the list to suit your needs and choices. Birthday & Party Planner app even reminds you the important tasks so that you do not mess things up. This is a unique and convenient app to plan and organize your party. By using the featured menus, you can quickly create your menu for your party. 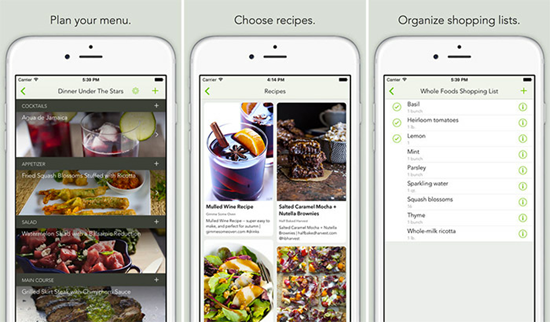 There is a built-in browser that helps you import recipes easily on iPhone. With BigNight, you can create your shopping lists and ensure that you will not forget the required things for the party. You can also add reminders to any of your task so that you are able to complete all by time. You can even share your special menu with your guests, relatives and friends via Facebook and Twitter or any social media to create great buzz about your very own party. 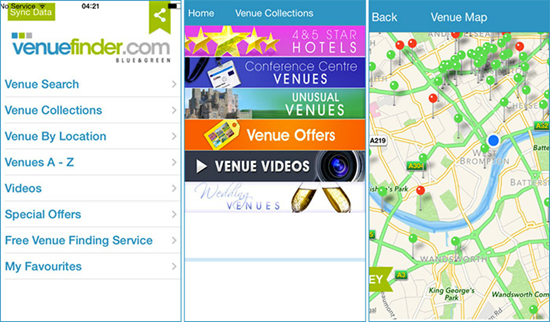 Venue Finder app is just great for finding the most suitable venue for any of your events. You can even search for about 15,000 venues by location and even by capacities on iPhone. With the app you will be able to search for famous places nearby your location. Find some of the best offers along with the latest availability with the Venue Finder app. This app also lets you check out the videos related to the venue you are seeking for your party. Well, if you do like any particular venue, you can directly contact them. With the app you can share its location and find the best venue for your dream event. 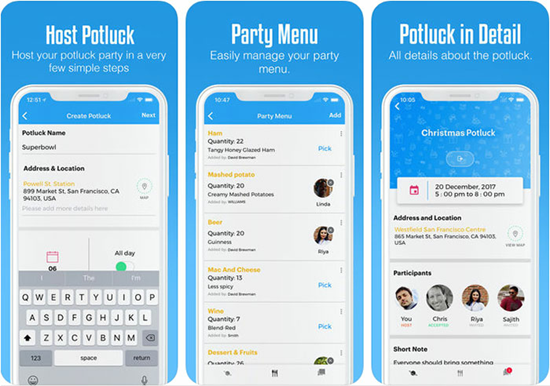 With the PotluckHub app for iPhone, planning and organizing party has just got simpler. You just need a few steps, and then you can quickly create a wonderful party. With the app you can give a fancy name to your party, add the location of your party, provide the date and time and add a quirky description as well. PotluckHub lets you invite your friends, co-mates and relatives using your contacts. You can quickly keep track of those who have accepted your invitation and you can also remind them who are yet to respond to your invitation. The in-app group chats lets you always stay in touch with your friends, co-mates and your family relatives. Planning for a great party or event ahead? 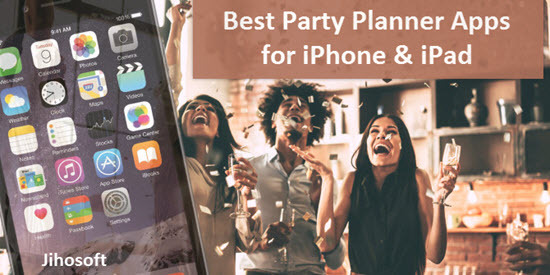 Pro Party Planner is one of the best application available for iOS devices that lets you smothly plan and organize your party. It lets you keep tracks of your guests, budget and even execute your planning and achieve the desired result. Quickly create seating charts with the app. Invite your friends or co-mates and start assigning tasks to them. Also you can keep an eye on the progress of your event and set reminders to get notified of the upcoming events and other plans with this app. 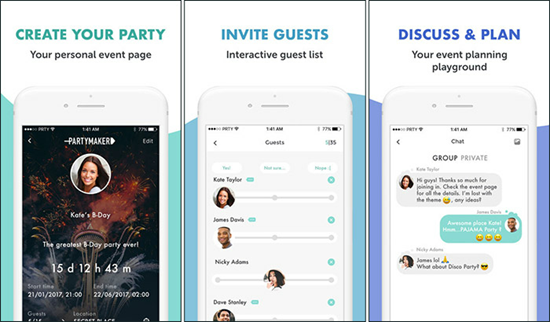 PartyMaker is your one-stop solution to manage every party, event or any special day on iPhone or iPad. It lets you create quick checklists, guest list to set a countdown, and much more. You can also prepare customized invitations to send to friends and family members. Set up your event page to connect to your loved ones and convey the message to them. Apart from usual tasks, the PartyMaker app helps you capture wonderful moments of your party so that you can later cherish the moments. These are our handpicked best party planner apps available for iPhone and iPad. Working too much? Take a break, organize a party with your friends, beloved ones and family members and make some wonderful memories. Go download your much needed party planner app for iOS device and plan a wonderful party. Different apps have different aims; you can use them wisefully according to your need. Groove your way to make awesome parties and manage events in a calm and composed way. If you have any question or other ideas, welcome to share with us by commenting down.